The lifestyle PR team here at L.E.R. PR is excited to see PlantShed featured on WWD.com. 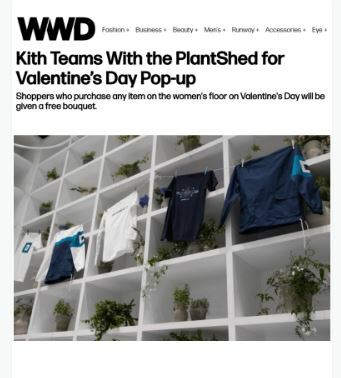 Plant Shed was featured in an editorial called “Kith Teams With the PlantShed for Valentine’s Day Pop-up” which prominently showcased the interior of the space, the collaboration, and the promotion that PlantShed and KITH provided for V-Day.